A Very Busy Day of Church - Almighty Father, your seeking servant prays for guidance. Yesterday was a FULL day at church. Three services, of which I served at the altar for two of them at 8 and 11:15 a.m. During the start of the 9 o'clock, I was still visiting with folks at the coffee hour (a planned excursion). I snuck into the back of the chapel for the middle service, only to see Heart Of My Heart get drafted to be a quick fill-in chalicist. 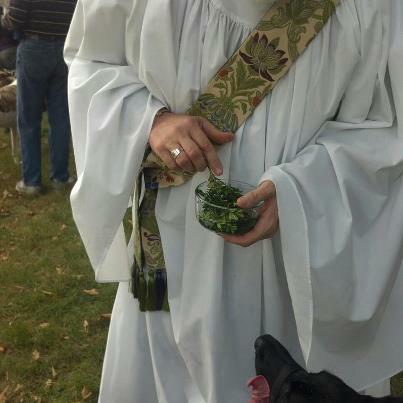 As folks returned from Communion and saw me sitting in the back, I received a range of facial expressions and gentle touches on the shoulder. Afterward, I was escorted to the different Sunday school classes to say hi and offer a brief prayer for the new church school year. I knelt with the Pre-K and Kindergarten/1st grade classes, sat in a tiny chair with the 2/3 grade children, and stood with the 4th/5th graders, before venturing into the kitchen where the Youth Group was making soup to sell at the annual Pumpkin Patch. The calamity increased from room to room. 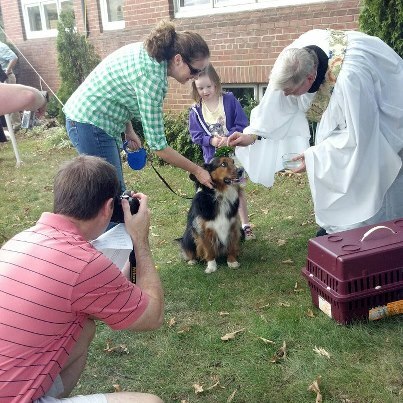 Later we had the 1st Blessing of the Animals at Immanuel in a good long while. There was mostly dogs, small, medium and large, some cats, and a hamster. Since HOMH winged her way back home late Saturday night, she was available to wrangle our own pups while I blessed them, and others. What an honor & privilege that was to bless those blessings from God. O God, source of all life, we give you thanks for the creatures of the world that provide us with food, offer us their protection, and keep us company in our own journey of this life. Amen. Then the clergy met with our wardens to touch base and ready for the next vestry meeting, Finally, I retreated to home to watch the Washington Redskins pull out a squeaker vs. the Tampa Bay Buccaneers. The best part of the game with our small circle of friends was our Goddaughter singing Hail to the Redskins with her parents and godparents. As Daddy Jay said, "That's just good parenting on all our parts!" Finally, to conclude the long day's activities, I ventured out into the cool evening as The Signing Deacon to strike again! Our annual Pumpkin Patch, this being the 16th year, will open next Sunday, October 7th! 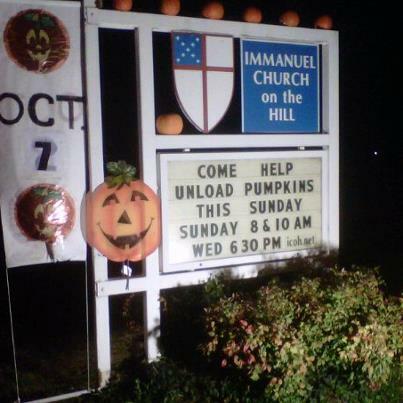 Immanuel Church-on-the-Hill is known as The Pumpkin Church. The selling of pumpkins, baked goods, and specially prepared soups and sundries helps fund ICOH's ENTIRE Outreach mission and ministry. It's about to get a whole lot busier at that little chapel associated with the Seminary across the road and up the Hill. Today is my Sabbath, and I am glad.